Sandton House is a beautiful contemporary home in a quiet neighbourhood, centrally located and only minutes from the front and back beaches by car and golf courses, hot springs, wineries, coastal shopping and all that the Peninsula has to offer. If you are looking for a place that can offer some quite time to recoup from a more hectic life or a home base to access the beautiful beaches, wineries, coastal shopping and peninsula delights... Sandton House is the place for you. There is a split system in the open plan living area and ceiling fans in each bedroom that adequately cools the house . External blinds can be used to provide an additional level of heat block out. There is ducted heating throughout the house as well as a split system in the living room. Luxurious bed linen and quilts are provided on all beds. Washing machine and detergent are provided as well as a clothes line and clothes horse. There is ample off-street parking for at least three cars and/or a boat or jet ski. All bath towels, handtowels, face washers and bath mats are provided as well as large beach towels for each guest. Additional towels are also provided for use at the hot springs. Open plan living style allows easy conversation and view of children across the kitchen, dining and lounge areas. Comfy couches and chairs allow relaxed television watching. Fully functional dishwasher and detergents provided to make ease for clean up. Large family size fridge/freezer with full ice trays and includes a welcoming bottle of champagne. Fully functional oven with grill and roasting trays and four burner stove top. Standard size microwave for use. Nescafe Dolce Gusto Piccolini Capsule Coffee machine available and includes a selection of coffee pods for use. Family size toaster which caters for thick slices is provided. All basic kitchen items provided, includes: tea and coffee bags, selection of coffee pods, salt, pepper, sugar, cooking oils, vegemite, glad wrap, alfoil, baking paper, paper towel and some spices. There are ample plates, cups, cooking and eating utensils provided as well as platters and bowls and servers. All necessary cooking pots, pans and utensils are provided including: steamer, wok, stick blender, juicer, rice cooker, colander, salad spinner, casserole/lasagne baking dishes, water jugs and esky. A large flat screen television is available and connected to the BluRay player. A small selection of books are available in the main bedroom for reading enjoyment. A selection of games suitable for adults and children are available, includes games such as Scrabble and Articulate. A selection of movies and series are available for viewing on the BluRay player. Sandton House boasts a huge decking area with BBQ facilities and an adequate sized table and seating for relaxed outdoor eating and entertainment. We had such a relaxing stay in this lovely home; such amazing attention to detail and everything you could possibly need. 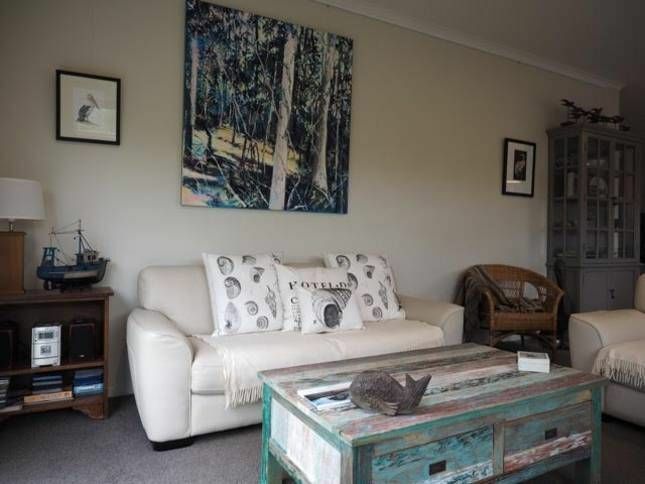 The owners were very helpful and we would highly recommend this home for a beach holiday. It was a pleasure to have Jacinta and Mark stay at Sandton House for their Easter break. They were easy guests to communicate with and cater for. We were glad that they were able to enjoy some of the outdoor living aspects and enjoyed the Hot Springs. They respected the place, left it very tidy and we look forward to a return visit from them. This place has everything you could want. It’s well located, 10 mins to the Hot Springs and near great towns and villages. The house is roomy and beautifully presented with high end decor, we thoroughly enjoyed our stay. Mum and I stayed at the Sandron House with my 8 month old daughter for 3 nights. We were presented with a spotless excellent furnished house with an amazing terrace/veranda out back where we spent most of our time. Kate and Aldo were very communicative and accomodating. We had a great time and will be happy to return one day. We were so glad that Barbra, her mum and baby had a great time down the Peninsula and enjoyed their stay at Sandton House. The weather was ideal for outdoor drinks and dinners on the large decking and for them to see the wonderful beaches and sights that are on offer. We hope they come again and highly recommend them to other hosts as the property as well looked after and left neat and tidy. Kate and Aldo have a lovely, well equipped home that is very inviting. Throughly enjoyed our stay and will be back. Angie and her family were a pleasure to host for, respected our home and left the place very tidy. We were so glad that they enjoyed their time down the Peninsula and look forward to a return visit. Aldo and I highly recommend Angie and her family to other hosts. This is our second stay at this lovely property and it didn’t fail to disappoint. The house is equipped with everything you need to make your stay as enjoyable as possible. The garden is massive and our dog absolutely loved running around in it! Kate and Aldo were more than helpful, recommending restaurants and even doggy beaches.